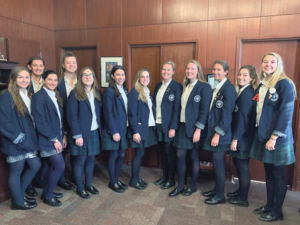 4/10/19—Students from Sacred Heart Academy received invitations to present their psychological research projects at the Association of Psychological Science (APS) National Convention in Washington, D.C. in May. Scholars from all over the world will gather to share cutting-edge insights. The Sacred Heart Academy students, consisting of nine seniors and three juniors, will present and discuss their original research alongside professional researchers. Sacred Heart Academy’s Science Research Director Stephen Sullivan encouraged the students to submit their respective projects to the convention, suggesting Social Psychology, Cognitive Psychology, and Educational Psychology as relevant subfields. A complete listing of student projects can be viewed here.